When I first had khasta kachori in Pune, I started missing the spicy potato curry we get as part of kachori in North India. I never realised that it has a special name to it and kept searching for that particular recipe. I finally ended my quest when I came across this recipe here. The curry is simple in preparation but has a characteristic taste of being spicy. The spiciness doesn’t come from red chilli but due to fresh grinding of cloves, you can reduce or increase the cloves based on how spicy you prefer. Cloves also lend dark colour to the curry. You can also cook in iron kadhai to get even darker colour. You can use store bought garam masala in place of grinding the fresh whole spices in step 2 for the paste, but using freshly ground garam masala imparts a different taste altogether. Refined flour (maida) is used to thicken the consistency of the curry, but you can skip it if you prefer. When I told a neighbour that I have used spinach in the curry, she couldn’t believe it. It was the prefect recipe and we really enjoyed with the kachoris. My mother has already asked me to make it again for her when I visit. 1. Peel boiled potatoes and mash them coarsely. In a heavy bottom pan, add mashed potatoes in it. 2. In a chutney/ spice jar, grind all the whole spices listed under to-grind to fine powder. Then add green chilli, ginger and spinach to the spice powder and grind again. The paste for the curry is ready. 3. Add this paste to the boiled potatoes along with remaining spices (dry mango powder, red chilliw powder, turmeric powder, black salt, salt) except maida listed above. Add water, roughly 1½ liters. Mix well and allow to cook on slow flame til it starts boiling. 4. Mix maida in ½ cup of water and add to the boiling curry. Stir well ensuring no lumps are formed. Let the curry cook for 40-45 minutes. Keep stirring in between to avoid potatoes sticking to the bottom. 5. Prepare tempering in a small pan. Heat ghee, add asafoetida and then cumin seeds. When cumin starts crackling, add whole red chillis. Pour this over the boiling curry. Switch off the flame. Sprinkle chopped coriander and cover the pan. 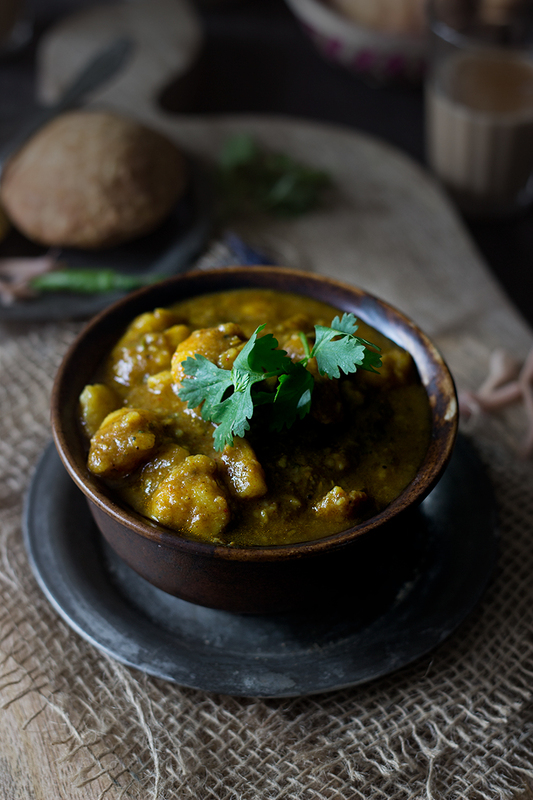 Rest for 15 minutes and serve hot with bedmi poori or moong dal kachori. Recipe minimally adapted from here. The spicy flavour comes from use of cloves. You can reduce or increase the cloves based on how spicy you prefer. Addition of cloves also adds the quintessential black colour of this dish, however it may also vary upon the pan you used like iron wok (iron kadhai). You can use store-bought garam masala in place of grinding the fresh whole spices in step 2 for the paste, but using freshly ground garam masala imparts a different taste altogether. Refined flour (maida) is used to thicken the consistency of the curry, but you can skip it if you prefer. Adjust potatoes based on your preference.